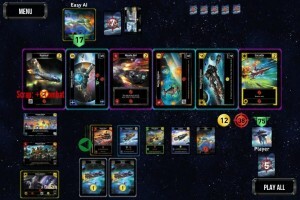 Nerds on Earth takes a look at the iOS version of Star Realms and gives us their thoughts on the situation in this article. Have you ever been to a baseball game and noticed that the people sitting behind home plate think every high fly ball is a home run, so they explode to their feet and their hands shoot up in the air? Of course, it turns out that it wasn’t a home run at all and the ball was caught in shallow right field, so all the fans just sit back down and make comments about what could’ve been. Hold that image because it will be relevant later on in this review of Star Realms for iOS.